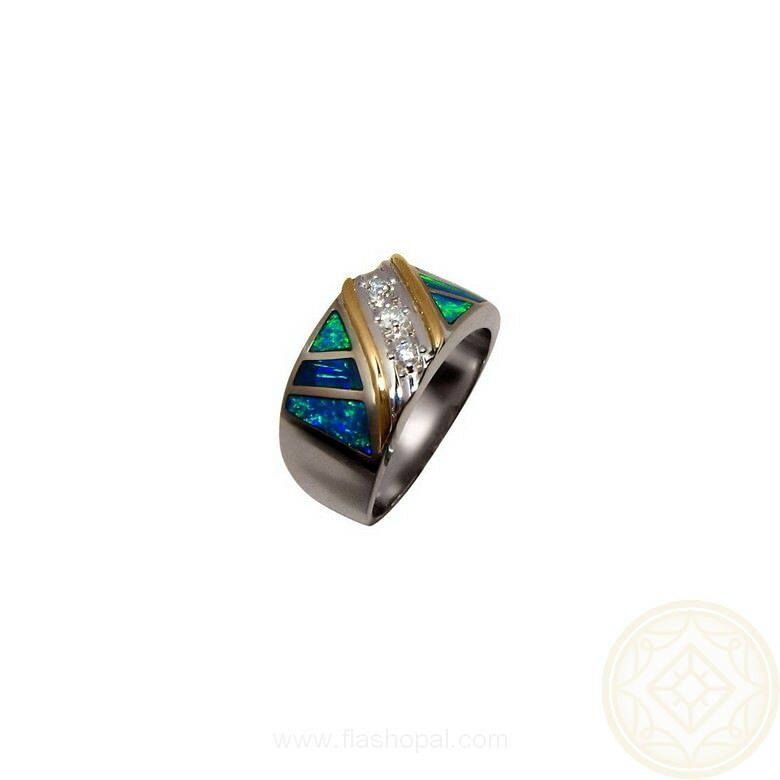 A mens Opal ring with diamonds in a wide band of two tone Gold with vibrant Opals of various sizes and shapes inlaid with precision and three quality Diamonds pave set in between. 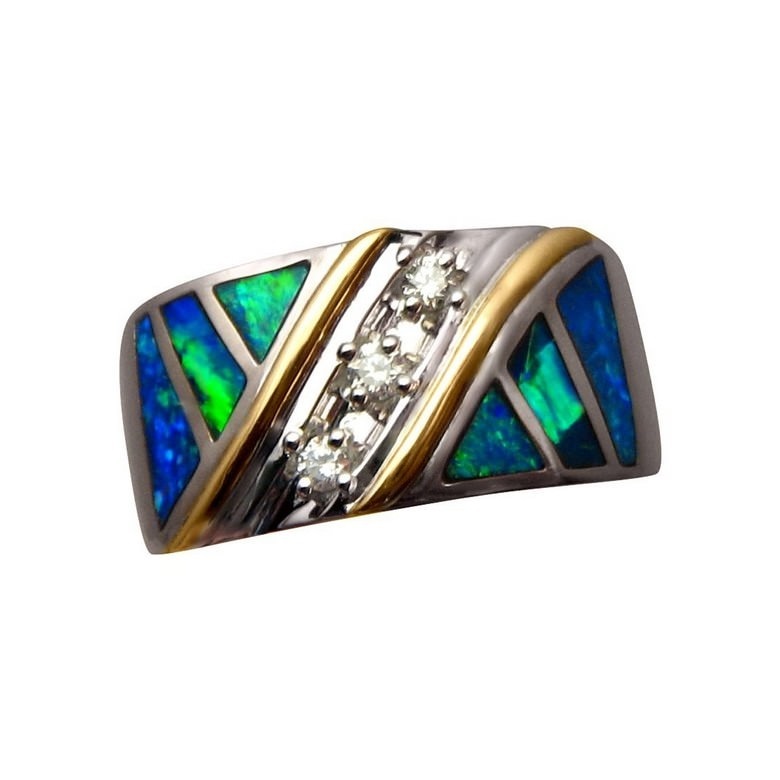 A mens ring that is a wide band of gold inlaid with Opals. Shown in two tone 10k Gold, the ring is mainly White Gold with two strips of Yellow Gold - one strip on each side of three quality Diamonds. The three pave Diamonds are of good size at 2.5 mm each and top quality at VS clarity and G-H in color. There are three Opals on either side of the Yellow Gold that are inlaid in random shapes and flash very bright Blue and Green color. 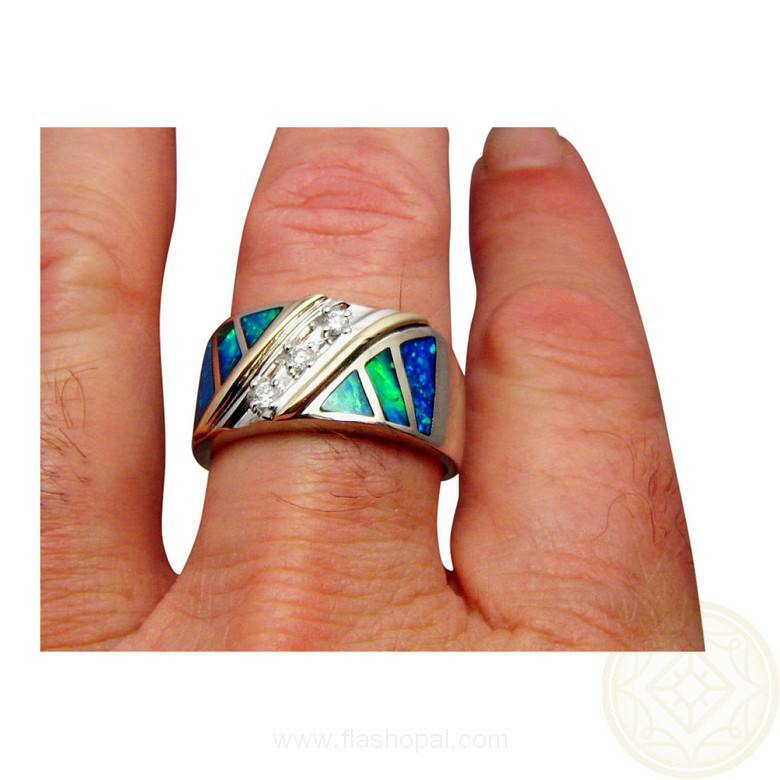 The video below will show the flash of the Opals and Diamonds although this is a style of ring best seen in person. 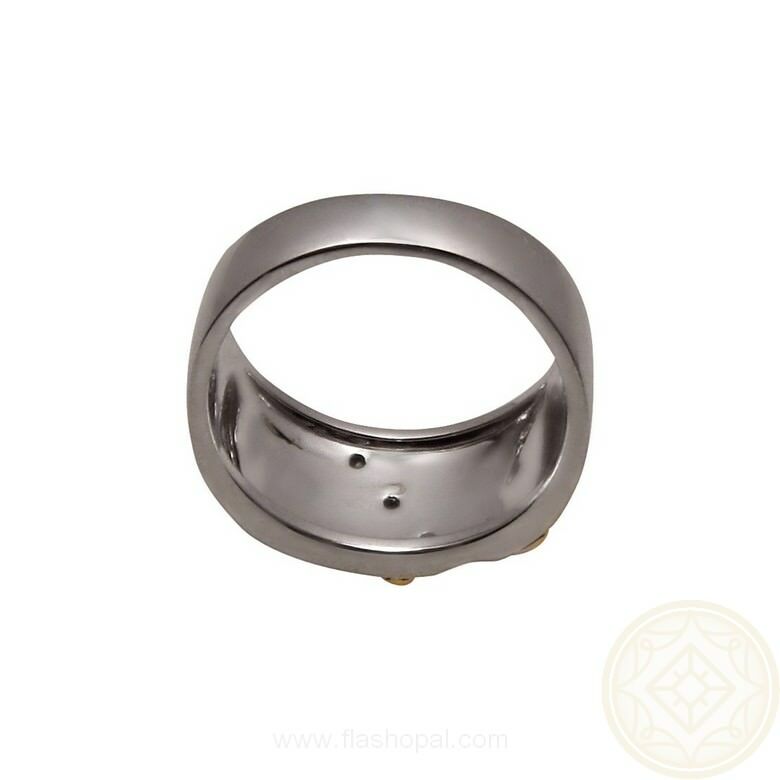 It is a heavy ring weighing about 12 grams for 10k Gold and is 12 mm wide with the Opals having a combined weight of about 5 carats so this is a ring that will be noticed on the finger. 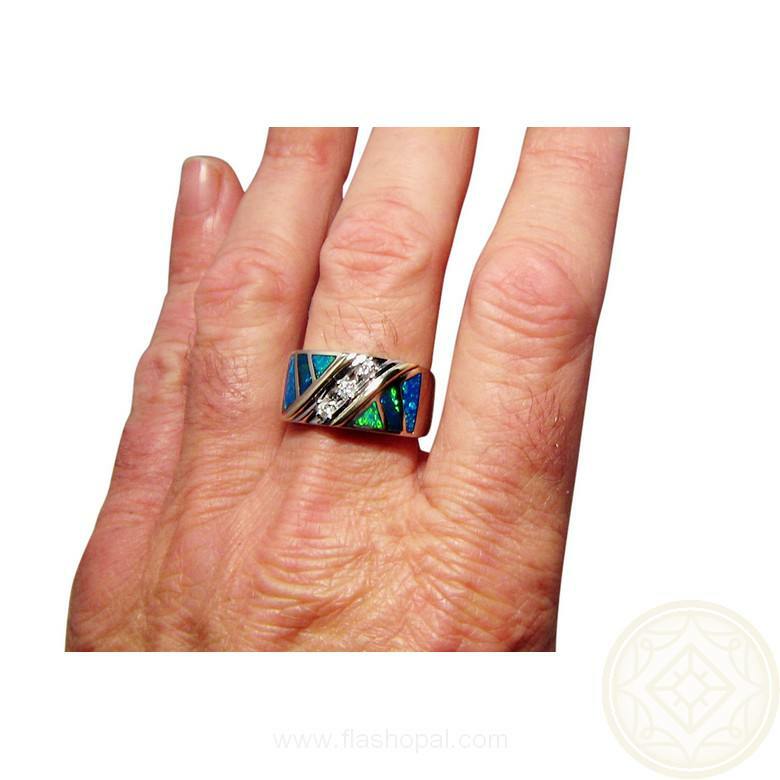 This stylish ring for men has quality gemstones and is Made to Order in any ring size in your choice of 10k or 14k Gold. When choosing the Gold, the first color is the dominant one. If you would like any aspect of the setting changed, such as changing the Opal color or Gold color or even the way the Diamonds are set, contact through this page for a no obligation quote. After my first weeding ring broke it was time to get a new ring. My first ring had the flash Opal inlay and not being able to find another one in the US I went to Kent and had a design in mind of what I wanted once we discussed what I wanted Kent went above and beyond when he created this master piece for me. I love this ring and it was more than what I could ask for. Awesome job and a great group to work with. Thank you so much for this.